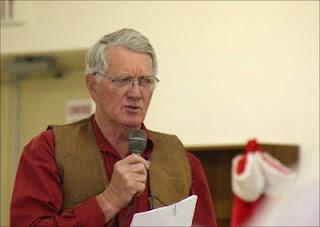 Long-time SDSU County Extension Agent Leo Orme – now retired – was the speaker for the December meeting of the Spearfish Area Historical Society. Click on any of the photographs shown here, if you'd like to see a larger image. “We’d be here all night, if I tried to cover all 42 barns that I’ve researched,” said Orme, who shared the histories of more than a dozen barns among the many scattered across Lawrence County. Orme had worked with Bob and Ann Matheney in assembling an exhibit about the barns back in 2000. It was part of a display at the High Plains Western Heritage Center, which was a local sponsor of a national Smithsonian Institution traveling exhibit about barns. A native of Colorado, Orme came to South Dakota in 1959 to lead a U.S. Fish and Wildlife project at the McNenny Fish Hatchery west of Spearfish. As a 4-H leader, and later as an SDSU Extension Agent, he became well acquainted with agricultural interests in the region, including many of the barns included in his research. Orme said he’s hoping to publish a book on the barns of Lawrence County sometime in the future. At right is one of the interesting barns included in his research. It belongs to Ralph and Becky Crago and is located near the Red Water River just north of Spearfish. A few snapshots from the December meeting -- and other programs -- can be found in our History Gallery. A more contemporary structure – but one of great popularity these days – is the Tretheway Pavilion in the Spearfish City Park. That’ll be the topic of the January gathering of the Spearfish Area Historical Society, when veteran writer Paul Higbee shares the history of the pavilion. His presentation will be at 7:30 p.m., Tuesday, January 5, 2010, and the public is invited to attend.